See more of this Cedar Furniture. 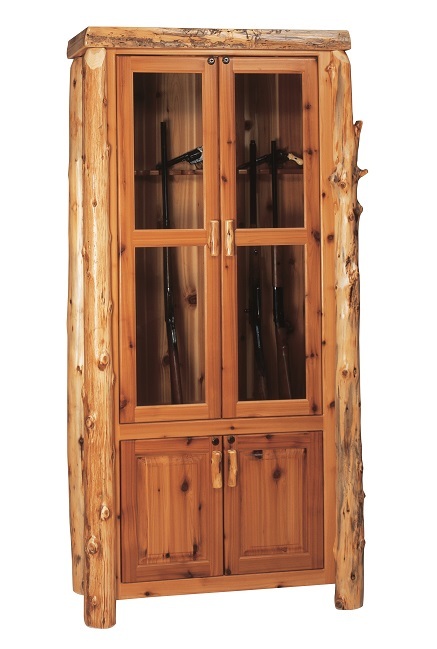 Display your guns in a cabinet that is as rustically beautiful as your more formal pieces of furniture. This charming cabinet would fit well into any room of the house and still safely lock up your guns and ammunition. The top glass-doors cabinet has lighting as a standard feature, and the bottom two cabinet doors hide one adjustable shelf on each side. Both upper and lower cabinets lock, and the locks and keys are included. This cabinet is available in an 8-gun model (shown in picture) or as a 12-gun model. Northern White Cedar logs are hand peeled to accentuate the natural character & beauty of the wood. A clear coat catalyzed lacquer finish gives extra durability to the furniture yet allows the attractive character to show through. Pay half now & half later with no sales tax! (Balance due upon shipment.) Estimated shipping: 3-8 weeks. Most of our Cedar Furniture ships via Motor Freight. Free Shipping on Fireside Lodge Cedar furniture orders over $1500, in the contiguous 48 states. Orders under $1500 for Fireside Lodge, please add $150 per order for shipping. Please call for quotes to Hawaii, Alaska and Canada.